It’s the sun rising over the Great Lakes, it’s the soil created by the mighty glacier, it’s the pristine water from the ancient Inland Sea, it’s our warm summer days and crisp autumn nights. That’s what makes the apples grown here better than those produced anywhere else. It’s because they’re flavored by Wisconsin. 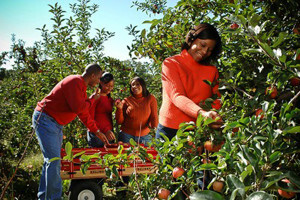 Voted one of the “Top Ten Best Orchards” in the country, Apple Holler is a 78 acre orchard that invites you to embrace the brilliance and beauty of the fall season when you and your family spend a day with us, experiencing our special ” Pick your own apples” outing from August through early November. There’s no substitute for being able to pick your own fresh fruit, and as you stroll through our spectacular orchard, you will see first-hand the abundant assortment of apples we have available for you to pick from. With more than 20,000 select dwarf trees featuring 30 varieties of apples, a day spent in our apple orchard will be a day that is not quickly forgotten. Check our picking calendar to see when your favorite apple is ready for picking. In addition to a fantastic pick your own apples experience, your admission will cover the entrance to our entertaining Farm Park, where you will find everything from barnyard animals and wagon rides to mazes and trains. We promise you a day packed with great family fun as we offer something for everyone to enjoy. We’re not only about apples! In late summer, enjoy pick-your-own peaches. For additional fruit variety beginning in early fall, try our pears. 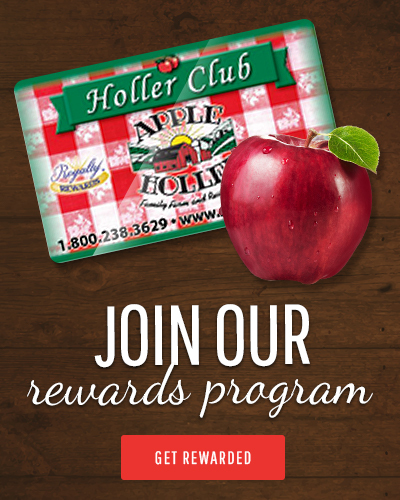 During the autumn months, Apple Holler has pumpkins available for the pickin’ in late September and October.